The chat will be facilitated by Bri O’Blivion @whowewilltobe. Many adjunct and part-time higher education instructors struggle earning a living through teaching multiple courses, often at multiple universities, frequently barely making enough income to survive. Moreover, it is increasingly a situation where some are seeking public assistance just to survive. Does this resonate with your experiences? Want to challenge the stigma associated with all this? Want to chat? 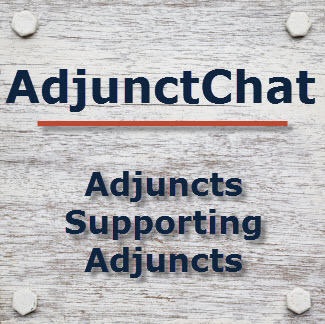 All adjunct, contingent, part-time, visiting, and non-tenure track instructors, along with their allies, in higher education are welcome to #AdjunctChat on Tuesday, June 3, from 4:00-5:00pm EDT. Even if you do not readily fit into the above, #AdjunctChat is open to all! The more perspectives, the better we all learn with and from one another. This entry was posted in Planning & Scheduling and tagged adjunct, public assistance on June 3, 2014 by Jeffrey Keefer. In California, unemployment wages are guaranteed to adjunct, but we still have to fight for them. The application is changed every year; one wrong answer triggers an interview, which postpones the payment sometimes for weeks. However, for adjuncts, claiming unemployment wages is claiming a small portion of wages you have already earned. It is no more shameful than collecting a paycheck, but it is absurd. An adjunct moment I once had reveals a flashpoint: a tenured once remarked to me that she also was unemployed during the summer break, but could not draw unemployment wages. Was she envious? Was she angry? Did she feel left out? She certainly was clueless.